Let’s DRIVE into the wedding reception shall we?! When Blake was just a teenager, his first car was this 1970/1974 Nova. When you speak with him about it, it’s pretty easy to see that it was his pride and joy. Through the years though, it suffered some hard times (it’s front end was damaged in an accident and it was three different colours that really needed updating). Through many conversations with his father, he shared the details of how he would — one day — fully restore the car, right down to what colour he’d have it painted. After much thought, and anticipation that he’d likely have a young family one day, his parents decided to surprise their son with a very special gift for his wedding. They took on the task late last year of having the car restored which included a magnificent brand new 500 horse power motor and the paint colour they new Blake had wanted. Then last week, they drove it more then 1500 kilometres from British Columbia to Saskatchewan in time for the wedding. As I mingled with their guests during cocktail hour and hearing what had happened outside the church, there was no way I wasn’t finding a way to include this car into their reception. So… after some quick determining that we did actually have room for it inside the amazingly transformed curling rink that was the location for their reception, a few phone calls where made. Yes… this grand entrance was about to become a little more dramatic! Following the words that detailed the moment they’d met until the moment of their wedding… an over head door opened and the curtains were pulled back. 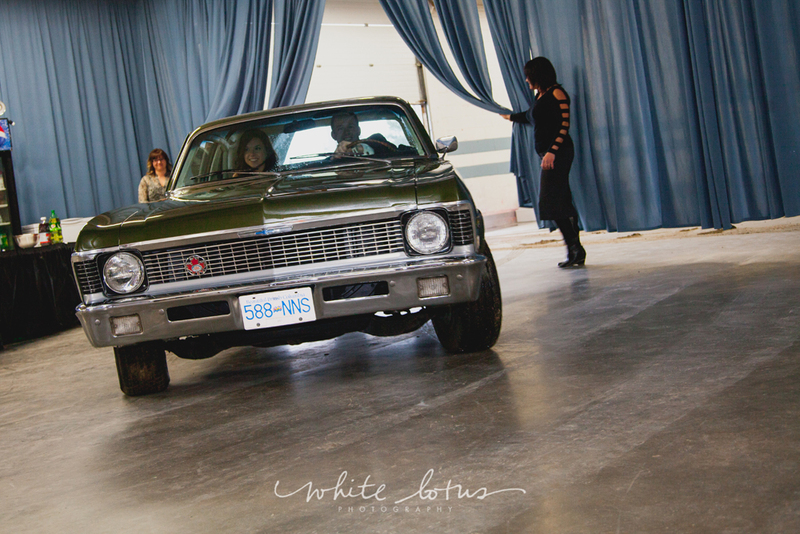 In rolled the sound of a 500 horse power engine with a beaming Blake & Seanna inside the newly restored Nova! Special thanks to the creative talents of Melissa from White Lotus Photography for providing me with this image to share with all of you (and her incredible “same day edit” for viewing that same evening!). She was awesome to work with and I’d recommend her anytime! It was a real treat working with both Blake & Seanna and meeting their outstanding families. I feel particularly lucky to do the work I do when such gracious people are involved. Many thanks to each and every person I spoke with that evening. You made the evening truly incredible with so many great moments to recall. I hope everyone enjoyed the evening!